Healthy veggies are not the most popular menu item, but we need them. It’s tricky to come up with veggies that the whole family will eat. If you can come up with a veggie your family likes and it’s cooked in the slow cooker, then you’ve accomplished quite a feat. I was craving vegetables one day since I’ve been visiting my daughter and her family and picked up squash and eggplant. The challenge was to get the whole family to like it. When I was a young girl, my mother often cooked squash. I loved it. Yellow summer squash. She didn’t ever cook zucchini. I don’t remember her cooking any other type of squash. But not once can I recall her cooking eggplant. Later, I started ordering an eggplant casserole at Luby’s Cafeteria. That was many years ago, and I don’t usually see eggplant cooked like Luby’s. Sometimes, I cook it on a griddle. I prefer mine peeled, though you don’t have to peel it. My favorite way of cooking it on my griddle is sliced thin, lengthwise, seasoned well, and cooked with a little coconut oil. This new slow cooker squash and eggplant recipe is different than what I’ve made before. If you like nutritious veggies and you like yellow summer squash and eggplant, then you’ll probably like this recipe. Cut vegetables into small pieces, quartered, but do not peel. Add vegetables to slow cooker. Cut the butter into thin slices and add on top of the veggies. Season and add onion, cream, and water. I served the veggies over brown rice. Not everyone cared for both vegetables. My son-in-law doesn’t typically like vegetables. The three-year-old sometimes will eat them, depending on what they are. She didn’t try the squash or eggplant. My daughter tried it and liked the squash but not the eggplant. The one that really surprised me was my little baby granddaughter. She’s 10 months old and loved the squash. She made a funny expression when she tasted the eggplant, although she ate it. She ate almost all her serving of both vegetables. If you like most vegetables, like me, you may like this one. Next time, I’ll try just the squash. I like squash just about any way it’s cooked. 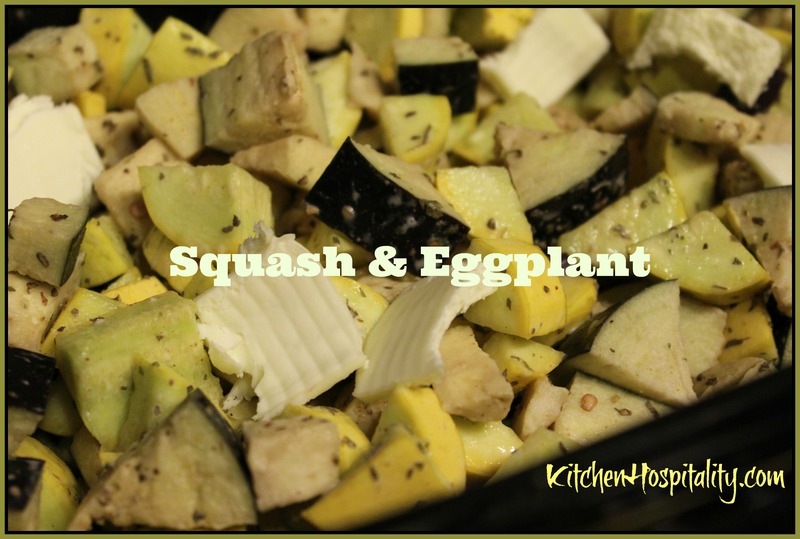 Got a squash and eggplant recipe you’ve tried? Take a moment to share it in the comments. I like the breaded/fried kind. I’ve been experimenting with different eggplant recipes. I’ve cooked mine on the griddle with coconut oil, too, and that tastes pretty good. I like to stir fry eggplant with other vegetables and add it to a sauce for pasta. Marissa, that sounds good. Do you peel your eggplant?